1. Begin by boiling a few cabbage leaves in water until they are soft, then drain them well and slice up into small pieces. Finely slice two or three cloves of garlic, two spring onions and a small piece of ginger. 2. Add your sliced vegetables and the minced pork meat to a bowl and mix well with a little sesame oil and soy sauce Try to use an equal amount of pork as your combined vegetables. Put this aside to marinade for a short while to allow the flavours to infuse. 3. Now we can start making the actual gyoza. With a gyoza skin in the palm of one hand, spoon a small amount of the mix into the centre of the skin. No need to overfill here, simply add an amount approximate to a teaspoons worth. Add a small amount of water to moisten the edge of the skin to make it easy to seal. 4. Fold the filled gyoza skin in half and pinch at the top to seal it. Now start folding over the skin on the side facing you and pinching it together to achieve an effect like a folding fan when it is open. The goal is to achieve a sealed wrap which has the folded texture on one side, but flat on the reverse side. 5. When you have made as many as you need, heat up a little cooking oil in a pan and gently place the gyoza in it with the flat side facing down. Cook on a high heat until the bottom of the gyoza become crispy and golden. 6. To finish cooking the gyoza, add a small cup of water to the pan so that the gyoza are half submerged. Place a lid on top of the pan and leave the heat on medium-high. 7. Allow the gyoza to steam cook until the water has evaporated, then leave them cooking on the bottom a little longer to make sure that they become crispy and delicious. 8. Serve the gyoza on a plate with the crispy side facing up and use a combination of soy sauce, rice vinegar and rayu to make a dipping sauce. Alternatively, you can skip this and use a ready made gyoza sauce. 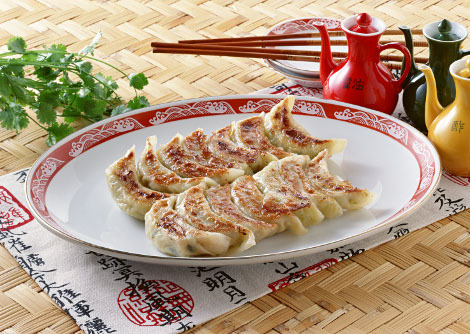 – Like most of our recipes, you can substitute the meat in these gyoza for other vegetables to make vegetarian gyoza. Try using shiitake mushrooms as an ideal substitution for meat. Similarly, you can also make chicken or prawn gyoza if you feel like a change from pork. – If you prefer to boil the gyoza instead of pan frying, chuck them in a large pan of boiling water and allow them to cook for a few minutes until they are ready. – You can also freeze uncooked gyoza to cook and eat them at a later date. This is a good idea as you can make lots of gyoza in one go and freeze any of the ones that you don’t use for lunch that day. – If you are having trouble folding and sealing the gyoza yourself, you can try using a special gyoza press which does the hard work for you. Simply lay a skin on the press, add your ingredients and moisten the edge with water before closing the mechanism and getting a perfect gyoza everytime. Combine this with the ready made gyoza dipping sauce and you will be whipping up tasty gyoza faster than a speeding bullet train! Posted in Food and tagged Gyoza. Bookmark the permalink. So glad you have started selling gyoza skins, they are impossible to find near where we live! Are they sendable with the rest of an order from Japan Centre, or do they require collecting from the store? Yes we can send them with other items in an order. They are sent in a special chilled box to keep them fresh! So glad I can get the wrappers with my orders now! Love LOVE gyoza 😀 Gonna try this recipe asap, mmmmm! the Yaki Gyoza recipe on youtube sounds much better, ‘Cooking with Dog’ is awesome. Chop vegetables very finely; stir-fry briefly in the oil with the soy sauce. Probably very inauthentic, but they taste very good! I learnt how to fold and cook gyoza from children’s TV in Japan – I was impressed that they’d teach children so young quite a challenging dish. (Well, if you want to fold it properly; and it can be tricky making sure they don’t stick to the pan). That’s the right idea!